Cambridge A Level students across INTI’s campuses enjoyed an overall passing rate of 96 per cent, with 26 per cent of them scoring 3As and above and 12 percent achieving 4As and above in the May/June 2013 exam. The recently released results indicate that they have the right approach to excel in a challenging yet globally recognized pre-university examination. 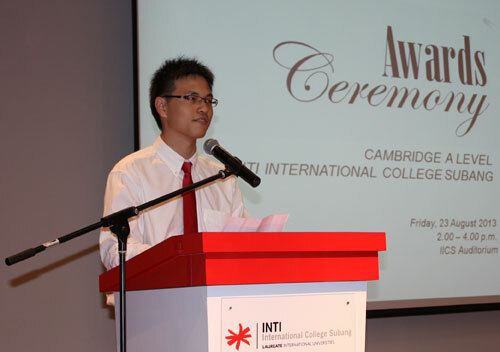 Tan Jia Gin obtained 4A*s to emerge as the top Cambridge A Level student at INTI International College Subang. Now pursuing his studies at University College London, Jia Gin was grateful to his dedicated lecturers for giving him the encouragement to go beyond his limits. “INTI lecturers are extremely approachable and I have never hesitated to seek their assistance to clear any doubts I have in my studies. INTI has also contributed to my success by providing me with ample facilities and resources in an environment that is very conducive for studies,” said Jia Gin, a former student of SMK Damansara Jaya in Petaling Jaya. Other 4A* students were Saw Kai Xuan, Chew Mei Shien, Gan Chien Nee, Goh Wan Xuan, Jessica Lieu Jes See and Tracy Lim Cyne Jeat. Both Wan Xuan and Tracy are now pursuing their studies in Nanyang Technological University, Singapore which is ranked among the World’s Top 50 universities in the prestigious QS World University Rankings. At INTI International University, Cheong See Mun, Chong Jiang Wei and Gan Ying Ying each obtained 4A*s to become the top scorers. Ying Ying, formerly of SMK Bukit Mewah, Seremban, attributed part of her success to a peaceful study environment which had enabled her to plan and organize her studies independently. “My lecturers have not only given me academic knowledge but also counseled me on personal matters. One thing worth mentioning is that through my lecturers, I have learnt to make good use of other resources, including the Internet. This has helped me to learn out of the classroom and beyond what academic and revision books have to offer,” she added. The high level of preparedness of INTI students for the Cambridge A Level exam is also evident from the excellent results enjoyed by INTI International College Penang (IICP) candidates. Vivian Khoo, Kharthik Chakravarthy, Melissa Saw, Lee Zi Thung and Esmond Chuah successfully obtained 4A*s each. Six other students achieved 3A*s each and another six scored 3A*s & 1A each. Kharthik is currently pursuing his studies in Mechanical Engineering at Imperial College London under JPA scholarship. “I chose to study at INTI because I was impressed by its track record of producing high achievers. If it weren’t for my highly qualified and experienced lecturers, I would not have done so well myself,” he said. His course mate, Melissa Saw, is also at Imperial College London studying Biomedical Engineering. The Cambridge A Level provides students with a wealth of options, right from having the opportunity to gain entry into many of the best universities in the world and studying a wide range of degree courses, to equipping students with reasoning ability and thinking skills as they embark on their degree programmes. For students seeking a gold standard academic qualification that is recognized globally as a gateway to world-class universities, the Cambridge A Level programme at INTI stands out as the programme of choice. University of Oxford, London School of Economics, University of Melbourne, National University of Singapore, and The University of Hong Kong are among the top universities in the world that have accepted INTI’s Cambridge A Level students. Many students have also been offered full or partial scholarships from these universities. Good grades in carefully chosen A Level subjects can result in one full year of advanced standing at universities in the US and Canada. For further information on INTI’s Cambridge A levels programme, please call 03-5623 2800 / 06-7982000 / 04-631 0138.